You don’t have to look very hard to find a pretty awesome towable tube. Floating down a lazy river on a warm summer afternoon might be a classic childhood experience, but having that tube behind a boat as you hold on for dear life is a great rush. With the right setup, it’s even possible to tow two or three tubes together at the same time. If you’re not into boarding or skiing, then give tubing a try. It might just be the perfect water recreation activity for you. There are numerous towable tubes available today and they’re all pretty good. How can you select the best one from so many incredible choices? The chart below is a great place to start. You can compare models and features so that you get the best towables shipped to you. What Are the Advantages of the Best Towable Tubes? What makes the best towables stand out from the other water recreation activities is that they can include multiple people at the same time. Water skiing typically involves one person behind a rope. The same is true for kneeboarding, wakeboarding, and other similar sports. Everyone else has to wait to take a turn while they watch one person have a good time. With tubing, everyone has a good time. That’s because there are toboggan-style towables available today that are able to seat up to six people safely at the same time. It isn’t uncommon to have three-person towables. Two-person towables are incredibly affordable. Some boat setups can allow for dual towing at the same time, which has the potential for 12 people being dragged through the water at speed. Now that’s what the Salty Dog calls a great time! What Are Some Common Problems With Towables? In one word: punctures. These are all inflatables, which means even the thickest, strongest tubing is going to lose a battle with driftwood, a discarded soft drink bottle, or some of the other forms of flotsam that can be found on certain water ways. This is why having an air compressor and a vinyl patch kit with you at all times when the best towable tubes are out is an essential part of the experience. This allows you to repair a puncture quickly so that everyone can get back out on the water with just a slight delay. A high quality towable rope is also an important part of the inflatables experience. You need to have a sturdy rope that is able to withstand a lot of punishment in the form of twisting and pulling, yet still have plenty of length so that everyone can have a great time being pulled. Ropes for towables are different than for other water sports, so make sure to purchase dedicated items. This is a nice towable that can hold up to three users at the same time with some solid handholds. 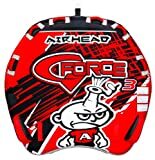 It’s got six neoprene knuckle guards included with the design and the nylon covered handles provide a good grip. The Boston valve included allows for quick inflation and deflating at the end of the day. The graphics are great, kids and adults are going to love it, and it is easily one of the best towables for the money that you can find right now. You could look at the patented valve that offers one of the fastest inflation experiences in the towables market right now as the best feature of this towable, but it’s the cool design of it that really stands out. There are front and back tow points on the Super Mable that give two very different riding experiences. The front riser construction and unique backrest provide a thrilling experience for up to three people and there are plenty of nylon handles and knuckle guards that will keep everyone safe. The Super Screamer provides the classic towables experience. 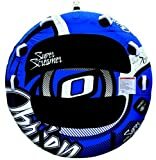 This round inflatable has enough room for two people and offers a 70-inch diameter riding area. There are 6 total handles available so that the right grip can be found and EVA knuckle guards will protect the hands effectively. Made from 26 gauge PVC and covered with a strong 420D nylon cover, this is a very well made tube that pulls well. It will scrape up some of the elbows, however, so be aware to wear some padding around them if you want to avoid the injury. This three person towable provides a seated experience that is thrilling and fun. It features three 30-gauge vinyl air chambers that are encased by double stitched 840D nylon. Seat pads and nylon wrapped handles are included, while the neoprene knuckle guards provide a soft experience for the hands. It’s large enough of a towable that it’s going to stay directly behind the boat, however, so those who want to get some air with their inflatables will either need to make sharp turns or find a different towable to enjoy. It is large enough to not need a center ball – a definite plus. 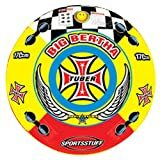 If you want the classic towables experience, but want four people to enjoy it simultaneously, the Big Bertha is one of the best towable tubes around right now. It’s got a heavy gauge PVC bladder with an air-cushioned floor that offers a comfortable riding experience. The hand guards make body positioning a little difficult if there are 4 tall adults on this towable, but the quick connect towing system makes up for the one small possible flaw some users might see. It’s strong, sits in the water well, and provides everyone with a good time. Always remember to wear your life jacket when you’re out on the water. Secure yourself with good handholds, select the best towable tube for your family size, invited your friends over, and then go enjoy a beautiful day on the water.